An astonishing look that matches the St. Moritz Dining Collection from Hanamint can be yours with the St. Moritz Square End Table from Hanamint. Hanamint Patio Accessories offer durable outdoor items that carry extended ten-year warranties. 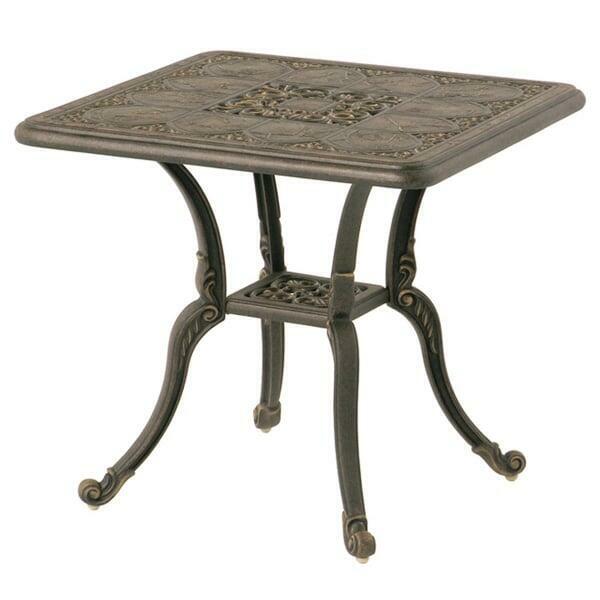 Along with solid construction techniques, Hanamint relies on classic, vintage and antique styles and designs to form this end table, with scrolled feet, an Acanthus or bell-flower motif in the knees and a beautiful table top of cast aluminum. And the Golden Bronze finish creates a two-toned look that is truly remarkable.